"...the Camp Dutch Oven is today's most versatile cooking system for (outdoor) family cooking. I highly recommend that you try the art of Dutch Oven cooking for the fun and great tastes..."
Lodge Logic are good pans except for one thing - they didn't polish the inide smooth before seasoning. I find making fried eggs or anything you want to hold together doesn't work well. Otherwise good quality cast iron. Lodge cast iron is the best! I own many pieces - 3 sizes of dutch ovens, 3 sizes of skillets, a griddle, a bacon press and a corn bread pan. I use them all the time in the kitchen and when campfire cooking, and I prefer them to any of the fancy new cookware out there. Lodge cast iron cooks evenly and if you take care of it (no dishwasher! No soap! Just wash with hot water and a scrubbie) and keep it seasoned (wipe it down with some vegetable oil after every use) it will last for generations. Lodge is the best brand - beware of the Chinese made knockoffs. I love it. Sturdy and will last for years and years. I got the 12 deep and I BBQ'ed a whole chicken (in pieces) and a rack of ribs in it. It's definitely big enough for a large group, but works well for my family of four, too. I LOVE this oven! I often cook over a campfire for a sizeable group of people. This deep, 14 oven allows me to meet the needs of the group without a problem. You can cook virtually anything in this oven and the taste is great! Bought it for my brother. He loves it and the quality is the best. 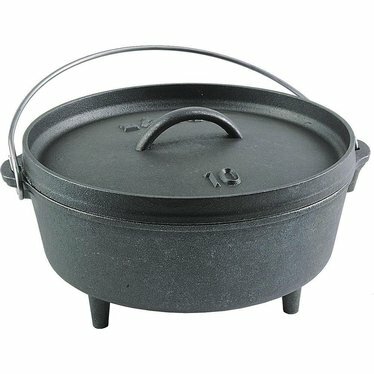 Lodge Cast Iron Dutch Ovens are the best investment you can make in cooking equipment. I have a 10 and 12 inch and use them both either at the ranch or at home in the oven. Cast iron makes the best post roast. Have several Lodge Logic camp ovens. Love them! Bought one for my Boy Scout Nephew and he loves it. Don't stop selling these camp ovens they are awesome!